Debbie Ridpath Ohi is a children’s book illustrator & writer in Toronto, Canada. Her illustrations will appear in I’M BORED, a new picture book written by Michael Ian Black, coming out from Simon & Schuster Books For Young Readers in Sept/2012. See the July 9th issue of Publisher’s Weekly for a starred review! For her blogs about writing & illustrating for young people, see: http://debbieohi.com. On Twitter: @inkyelbows. I love Debbie and I love this review SO MUCH. It’s a love explosion for me today at the Nerdy Book Club. This is amazing! I printed it out to put on my office wall. Well done!! This book looks awesome and I want to share the comic/graphic review with my Fourth Graders. Brilliant on so many levels. I love this unique approach to book reviews – so many ideas are coming into my head for the classroom applications for this idea. 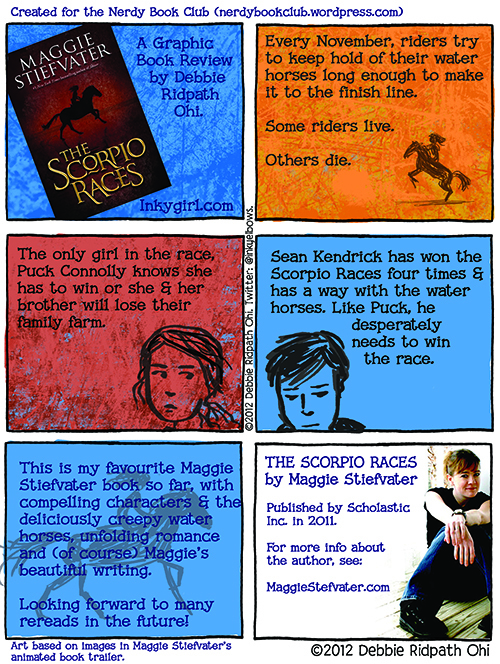 Plus, I am a huge Maggie Stiefvater fan and adored The Scorpio Races. What a great way to do a review. So cool! I just started this because Maggie is coming to an event at my library and I hadn’t read anything of hers (gasp!) Really enjoying it and looking forward to her other novels. Thanks for the kind words about my review, all!